Much hype surrounds the topic of gamification. Often seen as a technique to add engagement to existing tasks, projects, marketing campaigns, and initiatives, the term gamification unfortunately lacks the seriousness it deserves. This report seeks to change the point of view and demonstrate where gamification plays a role in the enterprise. More importantly, executives will discover how gamification can drive behavior and outcomes through both monetary and non-monetary incentives in enterprise class settings. In interviews with 55 early adopters of enterprise gamification, Constellation identifies the three core pillars that include measurable action, reputation and incentives. 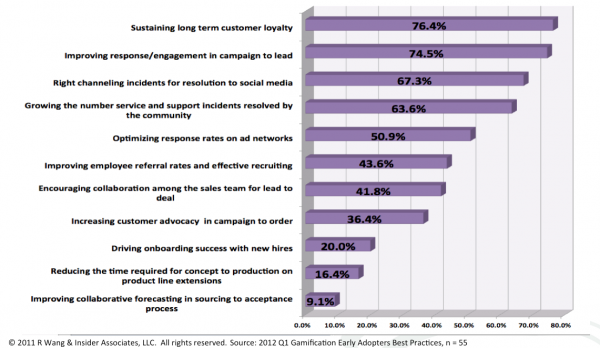 By creating triggers through both monetary and non-monetary incentives among customers, employees, partners, suppliers and other interested parties, organizations can secure sustainable engagement and drive business outcomes such as improved marketing response from external communities, sustained long-term customer loyalty, increased collaboration among internal teams, or enriched onboarding, delivering success with new hires, partners, and customers. Enterprise gamification requires an application of psychology and behavioral economics to incentivize outcomes. Because enterprise gamification maps closely to human behavior, organizations will want to follow Constellation’s best practices in appealing to the “Seven Deadly Sins” for gamification design. Designing your gamification models? What enterprise business processes will you gamify first? next? Ready to turbo charge your next generation customer experience? Have you tested out iActionable, CrowdTwist or the 3B’s (i.e. Badgeville, Bigdoor, and Bunchball? Ready to here how you can apply the white arts of the 7 Virtues to work? Add your comments to the blog or reach me via email: R (at) ConstellationRG (dot) com or R (at) SoftwareInsider (dot) com. Thanks to the following individuals for their review, input and contributions as part of the broader enterprise gamification community. Yvette Cameron (@yvettecameron) – VP & Principal Analyst, Constellation Research, Inc.
Ben Haines (@benlhaines) – CIO, Pabst Brewing Co.
Alan Lepofsky (@alanlepo) – VP & Principal Analyst, Constellation Research, Inc.